‘MEDITATION FOR YOU’ - A SIMPLE TO FOLLOW MEDITATION; is a series of 20 minute guided meditation audiobooks birthed from Benjamin’s popular online “TRUTH” Coaching System. With each of the specific topics within this meditation series you'll uncover the true value in that moment of conscious breath and release all expectation of the past while maintaining a deeply relaxed state. With mindfulness meditation proving to benefit thousands of people around the world, 'Meditation For You’ is your solution to less stress and a happier life. It's amazing. Reduced my anger within seconds and brought my negative behaviour under control. Thank you, Benjamin; you are a star. Controlled my inner monkey to the point of silence. For the first time in years I could sit without endless thoughts running around my mind. Brilliant. Absolutely fantastic. So relaxing I'm a new person. Not only am I able to relax better in the day but also seem to drift off to sleep at night so much quicker. Love it. For full effect, it is recommended to use this guided meditation audio session just before going to sleep at night or whenever required, using headphones. 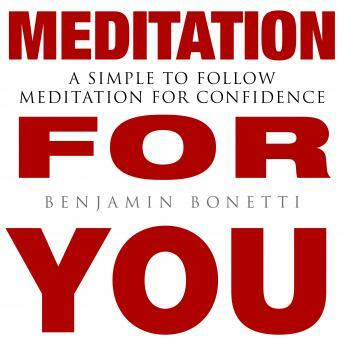 Note: The ‘Meditation For You’ - Guided Meditation Series: from Benjamin Bonetti is not suitable for those under 18. Do not use if you suffer from epilepsy, clinical depression or any other nervous or psychiatric conditions or whilst driving, exercising, operating machinery or taking alcohol or drugs. If in doubt, seek medical advice.